We are pleased to inform you that our Hidden Gem stock of June 2016 - Emmbi Industries Ltd (BSE Code: 533161, NSE Code: EMMBI) which was released on 17th July 2016 has achieved its target price giving as on date returns of 116% to our Hidden Gems members in period of 14 months. We suggested Buy on Emmbi Industries at price of Rs. 109.50 on 17th Jul'16 with a target price of Rs. 220. Stock has achieved our target price, Emmbi Industries share has made 52 week high of Rs. 246.50 today and closed at Rs. 236.75 on NSE giving absolute returns of 116% to our Hidden Gems members, we advise our members to continue to hold the stock. In Jun'17 quarter, net profit of Emmbi Industries rose 21.09% to Rs 3.56 crore against Rs 2.94 crore during the previous quarter ended June 2016. Sales rose 10.83% to Rs 59.23 crore in the quarter ended June 2017 as against Rs 53.44 crore during the previous quarter ended June 2016. Below is the summary of Emmbi Industries Ltd shared by us under Hidden Gem stock - Jun'16 released on 17th July 2016. Note: This report is shared only for the purpose of information and not an investment advice. Kindly carry out your own due diligence in case of investment in Emmbi Industries. 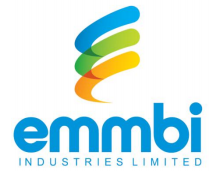 Emmbi Industries Limited (earlier known as Emmbi Polyarns Ltd.) is one of the well established company in the field of woven polyethylene and polypropylene product manufacturing. The company is engaged in the manufacture and sale of FIBC (Flexible Intermediate Bulk Containers) and Woven Sacks and various woven polymer based products like Container Liners, Protective Irrigation System, Canal Liners, Flexi Tanks, Car Covers etc. Emmbi is an ISO certified Company, it has a fully equipped manufacturing facility located at Silvassa in the Union Territory of Dadra and Nagar Haveli. The company products are mainly used in packaging, infrastructure, housing, disaster management and Hazardous waste disposal industry. The company supplies these products to various customers in domestic as well as international markets. The major customers in the domestic market include multinational companies in FMCG sector. Internationally, the customers are major automobile manufacturers, major glass manufacturers, major cement manufacturers, leading seed manufacturer, players in the petrochemical industry, and various other international customers. Exports contributed 49% of total revenue in FY16 with major contribution from Europe (32%) and American markets (31%). Emmbi exports to over 52 countries and is aiming to establish its own distribution network for overseas business in coming years. All its products are polymer based with polypropylene as its major raw material. In synthetic packaging, it manufactures polymer based flexible intermediate bulk containers (FIBC) that are both generalised as well as embedded with specific properties. Emmbi was incorporated in 1994 by first generation entrepreneurs i.e. Makrand Appalwar and Rinku Appalwar, with initial years confined to trading of FIBC with the company venturing into manufacturing of the same in 1997 with a plant in Silvassa. In 2005, Emmbi installed and commissioned the polypropylene based packaging unit with a capacity of 6000 metric tonne. In 2010, Emmbi got listed on NSE and BSE. The IPO came in at a price of Rs. 45 per share and the company garnered 39 crore, mainly for expanding its manufacturing facilities domestically. Post IPO, Emmbi expanded its capacity from 6000 tonne to 18200 tonne in a phased manner. Capacity utilization in FY16 stood at 83% (up from 65% in the previous year), leading to better operational metrics. Emmbi’s product profile is classified into four main segments, out of which Advance Composites, Water Conservation Products and Agri products constitute the Value added products in product portfolio of Emmbi. 1. Specialty Packaging Products: General Purpose FIBC, Baffle Bag, and FIBC of Different Shape Container Liner, PWS & Films. 3. Water Conservation Products: Canal Liners, Pond Liners, Check Dams, Flexi Tank. 4. Agri Products: Crop Covers, Silage Incubator, Mulch Films, Shade Nets. Global polymer consumption is expected to grow close to 4 times in two decades from 2000. Production of Polymer is expected to reach 540 million TPA in 2020 from 365 million TPA in 2010. The completely man-made nature of polymers makes innovation and creation of new materials virtually limitless. Moreover, advances in material technology are creating new applications for polymers, further fueling this growth. 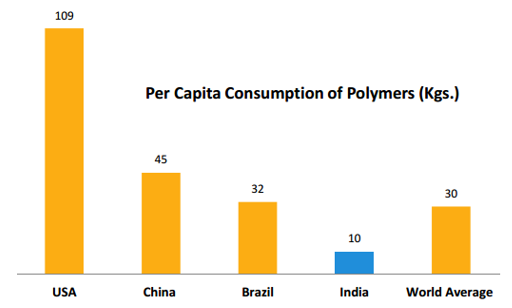 India’s consumption of polymers is still a third of the global average and is significantly low compared to other countries like China and Brazil other than USA. As the country urbanizes and grows economically, we see a significant uptick in polymer consumption which is expected to augur well for Emmbi Industries. With main thrust of Emmbi Industries on water conservation and agri products which are intended for domestic markets and are value added products, we expect significant increase in revenues from domestic sales compared to exports. The company has set up the Emmbi Innovation Lab, an independent R&D Centre which has received approval for the Lab by the Department of Industrial Research, Science & Technology. Emmbi focused efforts in product development has resulted in 11 patents, which gives Emmbi an edge over competitors in terms of product offerings and command better margins. Continuous innovation has helped company to increase its share of value added products in the product portfolio with shift in the product mix towards high margin contributors. As per management, the recognition enables Emmbi Industries to avail number of fiscal incentives, the primary one being the ability to claim Weighted Deduction of 200% of the company’s total R&D expenditure subject to approval from Income tax department. Excise & Custom Duty Exemptions for the products patented by the company as per Govt. Notification No24 /2007 & 16 /2007 with the right terms & Conditions. Emmbi Innovation Lab has filed Six Product Patents and Five process patents for various products & processes over the past 2 years. Emmbi Industries won the prestigious “India SME 100 Awards, 2016” presented by SME India Forum. Mrs. Rinku Appalwar, CFO of Emmbi Industries Ltd received the award from Shri. Kalraj Mishra, Hon’ble Union Minister of MSME, Shri. Suresh Prabhu, Hon’ble Union Minister of Railways, Govt. of India and Smt. Shika Sharma, MD & CEO, Axis Bank. Emmbi Industries has won this award among total of 49023 nominations filed by SMEs from all over the country. The project will take 10 to 12 months to complete and start the production. Total estimated cost of the project will be Rs. 10 Crores. Project will be funded by internal generation and debt from the banks. Company is constructing the building on the land which was already available with company. This will help company to produce the Food & Pharma Grade products for the Export Market. This will enhance the value addition of the products, especially in USA as the New USFDA guidelines recommends the use of food grade material for packaging for the entire value-chain of Food and Pharma. Net profit of Emmbi Industries rose 28.82% to Rs 3.71 crore in the quarter ended March 2016 as against Rs 2.88 crore during the previous quarter ended March 2015. Sales rose 14.15% to Rs 56.07 crore in the quarter ended March 2016 as against Rs 49.12 crore during the previous quarter ended March 2015. For the full year, net profit rose 77.55% to Rs 10.60 crore in the year ended March 2016 as against Rs 5.97 crore during the previous year ended March 2015. Sales rose 13.32% to Rs 206.94 crore in the year ended March 2016 as against Rs 182.62 crore during the previous year ended March 2015. Net profit of Emmbi Industries rose 54.60% to Rs 2.52 crore in the quarter ended December 2015 as against Rs 1.63 crore during the previous quarter ended December 2014. Sales rose 2.36% to Rs 52.87 crore in the quarter ended December 2015 as against Rs 51.65 crore during the previous quarter ended December 2014. Going forward on the back of robust growth in profitability over next 2 years, we expect further improvement in return ratios. We expect company will deliver sales CAGR of 19% with EBITDA growth of 22% over next 2 years considering robust demand and increase in sales contribution from value added products. i) Rise in Raw Material Prices - The rise in raw material price can impact operating margins of the company for its non-specialty products. ii) Intense Competition – There are many organized and unorganized players in the Industry offering similar products without any pricing power due to which it’s a low margin business. Hence, it is important for the company to adapt new technologies, offer product innovation, identifying and meeting customer’s expectations in term of high quality, product services and performance to remain ahead of the competition. i) In last few years, Emmbi has acquired substantial share in the international market for various packaging needs for products like Construction Aggregates, Chemicals, Seeds, Fertilizers, and Cement & Food Grains etc. Some of the high value added products which company manufactures for the international market includes Car/Automobile Covers, Container Liners, Anti Corrosive Packaging, Electrically conductive polymer based packaging, etc. To drive domestic growth, Emmbi introduced value added products in water conservation and agriculture space and increased its focus on marketing efforts to develop distribution network in rural India. ii) Emmbi Innovation Lab i.e R & D arm of the company has received Certificate of Registration from the Department of Scientific and Industrial Research (DSIR), Ministry of science & Technology, Government of India, which is valid till 31st March, 2018. Govt recognizes the innovation carried out by Emmbi, this recognition enables Emmbi to avail number of fiscal incentives and will results in tax benefits to the company during next 3 years. iii) Emmbi has recently started the construction of Positive Pressure Clean Room facility for manufacturing of Food and Pharmaceutical Grade FIBC packaging material with estimated project cost of 10 crores. This facility is expected to start production by April 2017 and will help the company to enhance the value addition of the products, especially in USA as the new USFDA guidelines recommends the use of food grade material for packaging for the entire value-chain of Food and Pharma. iv) The company is currently present in 52 countries and is planning to increase its geographical reach to more than 65 countries in near future with increase in its products offering. The company has already launched several innovative products in last financial year whose applications can be found in food, safety, water conservation, agriculture, infrastructure, e-commerce, crop protection, hazardous waste management and solid waste management. v) Company has registered sales CAGR of 28.81% and profit CAGR of 27.53% during last 5 years with significant improvement in ROE. The Company has been able to improve its working capital cycle from 170 days in FY15 to 130 days in FY16 owing to increased share of domestic business from 47% in FY15 to 51% in FY16, which resulted in efficient application of funds reducing interest burden & improving debt-equity ratio. vi) As of Mar’16, promoter’s shareholding in the company is at 57.86%, promoters have increased their holding in the company by 5.49% during last two years. Increase in shareholding by promoters on every passing quarter indicates the confidence of management in robust growth outlook and business prospects, Company has not pledged any shares, Institution shareholding is nil in the company. vii) Management has rewarded shareholders by paying regular dividend since last 5 years. The company paid dividend of Rs. 0.30 per share for FY15 and we expect management to declare dividend of Rs. 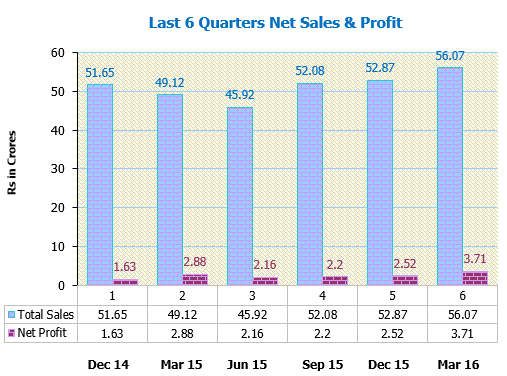 0.50 per share for FY16 considering significant increase in EPS during last financial year. As the company has recently initiated development of new facility with expected outgo of Rs. 10 crores, we find dividend policy suitable in terms of sharing profit with minority shareholders and retaining the balance for future growth. viii) As per our estimates, Emmbi Industries can deliver PAT of 14.85 crores for full financial year 2016-17, annualized EPS of Rs 8.40 with forward P/E ratio of 13X for FY16-17. Company’s valuation looks attractive considering improvement in financials, better return ratios and robust growth outlook in domestic as well as export market over next 2 years. ix) On equity of Rs. 17.69 crore, the estimated annualized EPS for FY 16-17 works out to Rs. 8.40 and the Book Value per share is Rs. 41.84. At current market price of Rs. 109.50, stock price to book value is 2.62. Considering increase in sales contribution from high margin value added product, better working capital control with increasing share of domestic sales, tax benefits to company’s R & D facility during next 3 years and higher earning visibility in FY17-18 with upcoming food and pharmaceutical grade FIBC packaging facility, Saral Gyan team recommends “Buy” on Emmbi Industries Ltd at current market price of Rs. 109.50 for target of Rs. 220 over a period of 12 to 24 months.